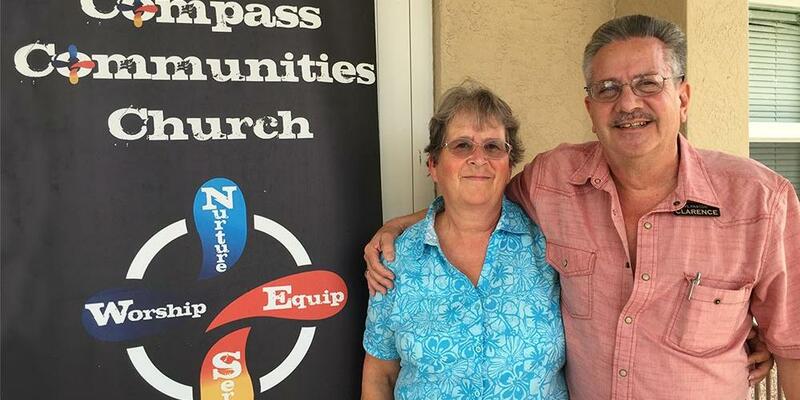 Clarence and Donna Dunbar’s dream to start a new congregation came true six years ago with the establishment of the Compass Communities church plant. It’s Sabbath morning at the Compass Communities church plant in Port Charlotte, Florida. You’re just in time for worship, but just so you know, they do church a little differently here. For starters, they meet in a soup kitchen where they serve up love to people who have fallen through the cracks of society. The jobless, the homeless, and those struggling with disabilities, addictions, or broken lives are all welcomed with a warm hug when they walk through the doors. This ethnically and economically diverse church is the fruit of the Holy Spirit’s leading in the lives of lay pastors Clarence and Donna Dunbar and cofounder Pastor Anthony Wagnersmith. One of Compass Communities’ top priorities is the homeless to whom they provide clothing, companionship, and help for numerous addictions. “It’s really neat to see people break the chains of addiction and embrace living the abundant life that Jesus came to give,” says Clarence. Compass Communities also participates in the soup kitchen program. Their forte is Friday evening when the fare is extra special to remind diners of God’s love for them. Church members personally serve each guest, and there’s even a menu! Another high-priority group for Compass Communities is the community youth. When Donna learned that there were 8,000 local children who didn’t know Jesus, she joined a ministry for middleschoolers. Donna learned the children’s names and little things about them. She helped them raise money to go to camp, took them to the mall, and invited them to pool parties at her home. In time she became a trusted friend. The Compass Communities members have loved quite a few people into their church family. But there’s so much more that they want to do, such as starting a Pathfinder club and hosting seminars. They long for a building of their own so that they can fellowship for more than just a few hours each week and create a center of influence that ministers to the community in even more ways. Please pray for Donna and Clarence and all our church planters as they raise new groups of Seventh-day Adventist believers around the world. Your global Mission donations help fund Global Mission pioneers, church planters, and centers of influence. Thank you for making their ministry possible! Clarence and Donna’s dream to start a new congregation came true six years ago with the help of church planter Pastor Anthony Wagnersmith. They’ve been married for 22 years and live in Port Charlotte, Florida.